Like a crepe but not. I was feeling peckish and didn’t know what to make. 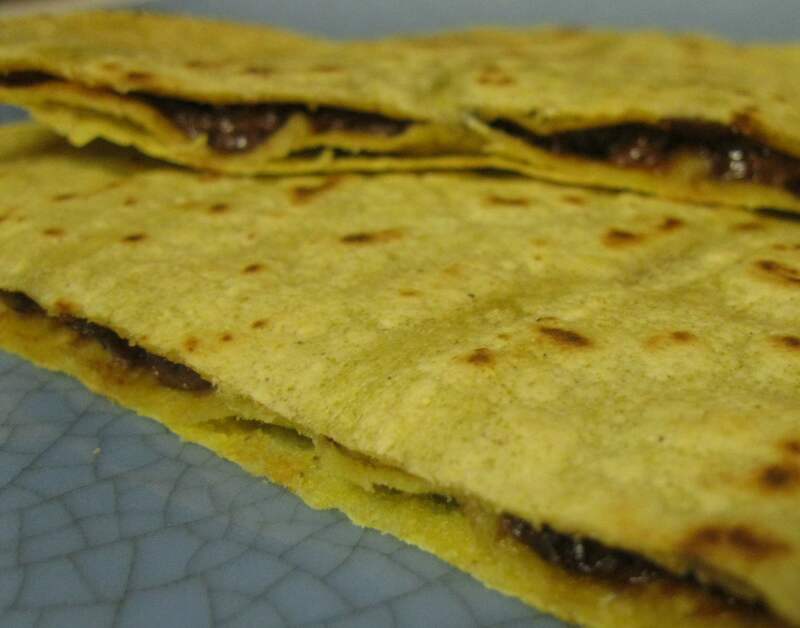 I found some currants, chocolate peanutbutter and some corn tortillas. I threw them into the pan and got it all hot and toasty. I made this: the chocolate ummm…. what do I call it!? It was worth sharing. Next time I might include strawberry jam and chopped pecans. Enjoy! This is Christie, signing off! I would say that this is a classic lazy vegan post but it does require some effort, like opening a package and slaving over a hot stove for 5 minutes. 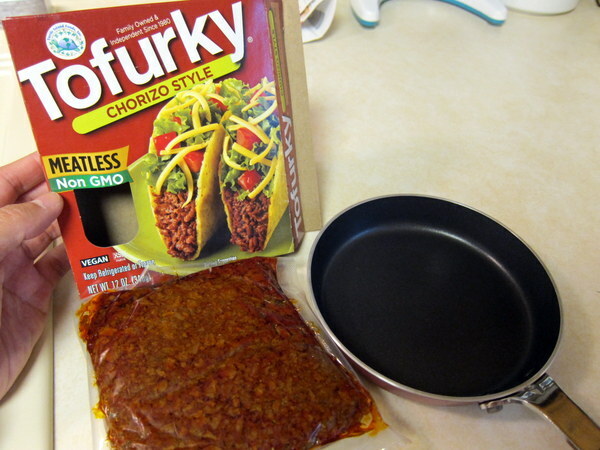 I wanted a tasty dinner with minimal effort, so I decided to finally try the Tofurky Chorizo Style product that has been sitting in my fridge. It was perfect because I already had tortillas and only had to stop at the store for some pepperjack Daiya. 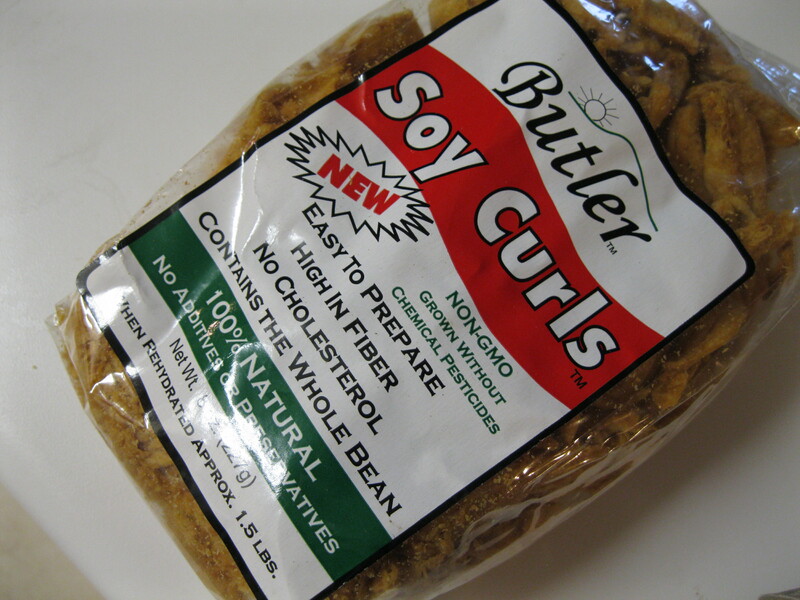 The product definitely looks meaty and once you open the pack, you can smell all the scrumptious spices. “That smells SPICY!” said my niece as it cooked. 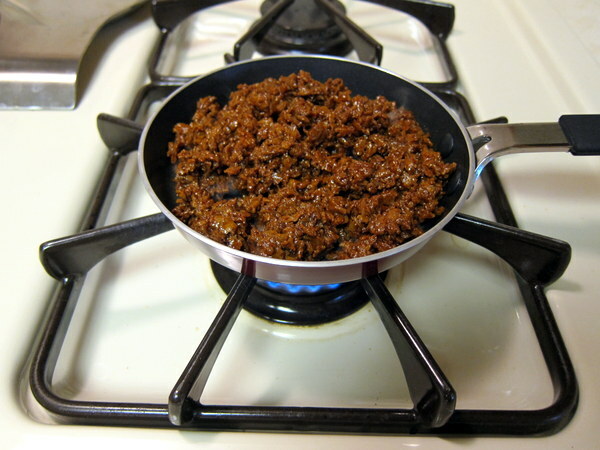 I heated up the ‘chorizo’ in a mini frying pan for 5 minutes. 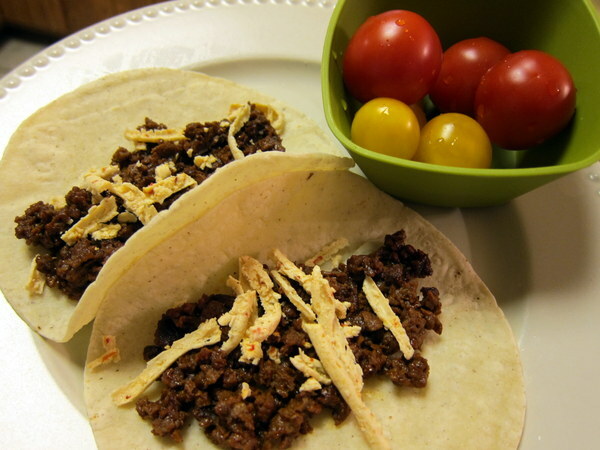 I served them on tortillas with some Daiya pepperjeck and a side of tomatoes. The product smelled spicy and it is tasty, but it could use more embellishment. 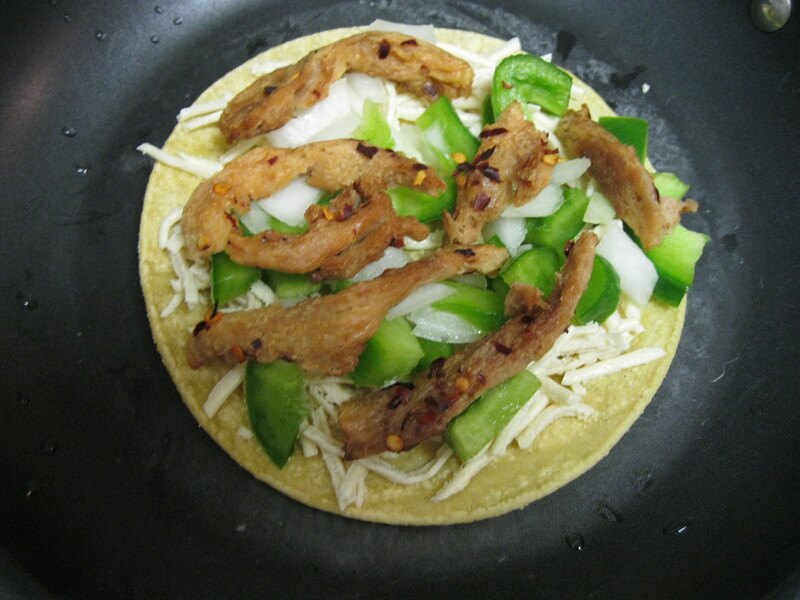 I plan to add some garlic and/or onion powder and to serve it with hot sauce or fresh salsa. But it is good as-is and met my needs this evening. This is a post that I’ll alternatively title “things I miss from ‘before'”. Chicken Caesar wraps and chicken Caesar salads contain the big “no-nos” as far as my digestive tract is concerned: gluten, dairy and eggs. This is an incredibly simple recipe and delicious as well as being higher protein and lower fat than the traditional stuff. Blend until smooth, adjust the seasonings as necessary. 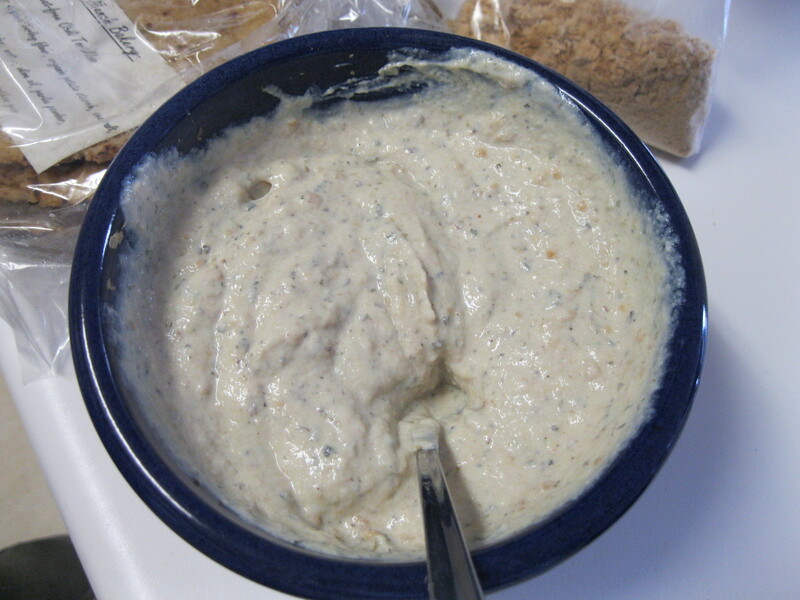 Be careful you pick Dijon mustard for your Ceasar dressing: some mustards will make your dressing taste weird. This is a low fat, no cholesterol and high protein version of your favorite with all the creamy texture and great flavor. 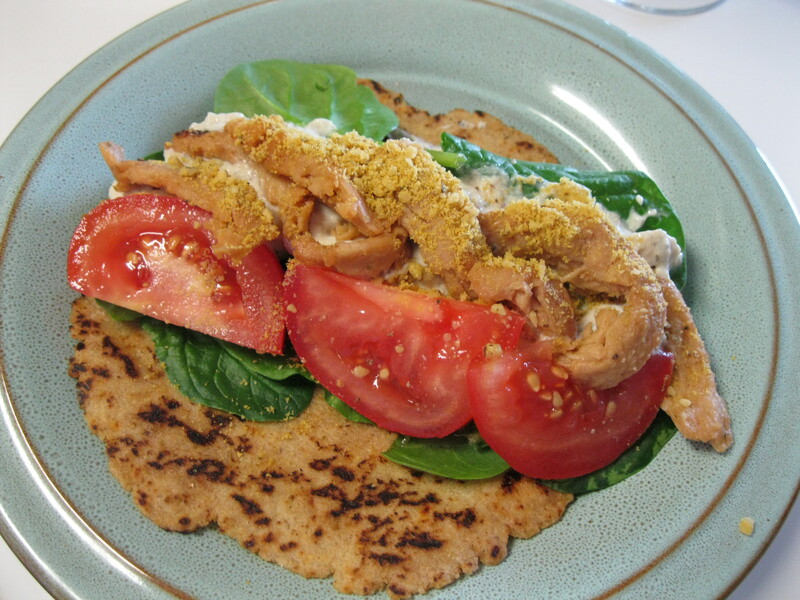 We combined it with soy curls prepared according to the package directions and baked until crispy, spinach, tomato and Eat in the Raw vegan parmesan and wrapped it up in Hayle’s red chili tortillas for a healthy vegan dinner. It was quite a treat! This is Brent and Christie, signing off. 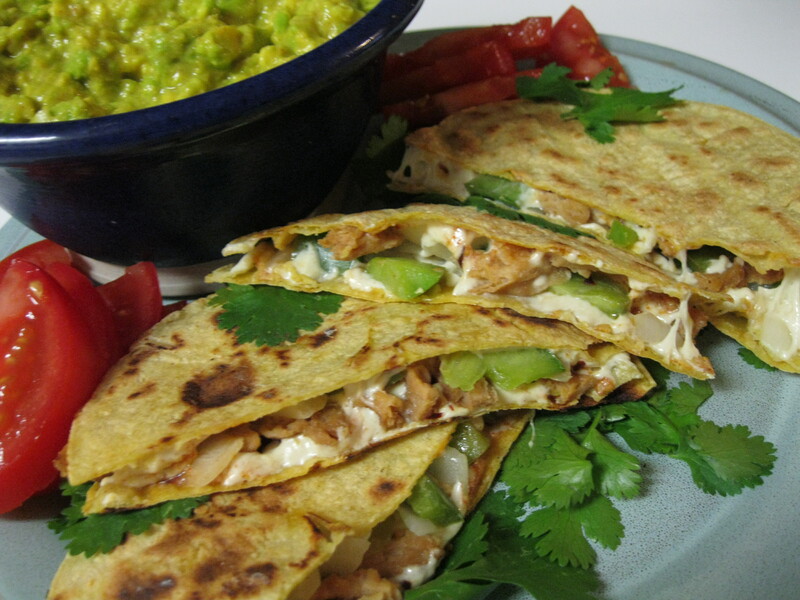 Quesadillas… you know you want some. I’m dressing things up a little tonight and adding soy curls. They’re a lot like chicken except that all by themselves they’ve got a nutty flavor and no gristle. I prepare mine by reconstituting in water in my microwave, draining, and spreading out on a foil lined baking sheet. 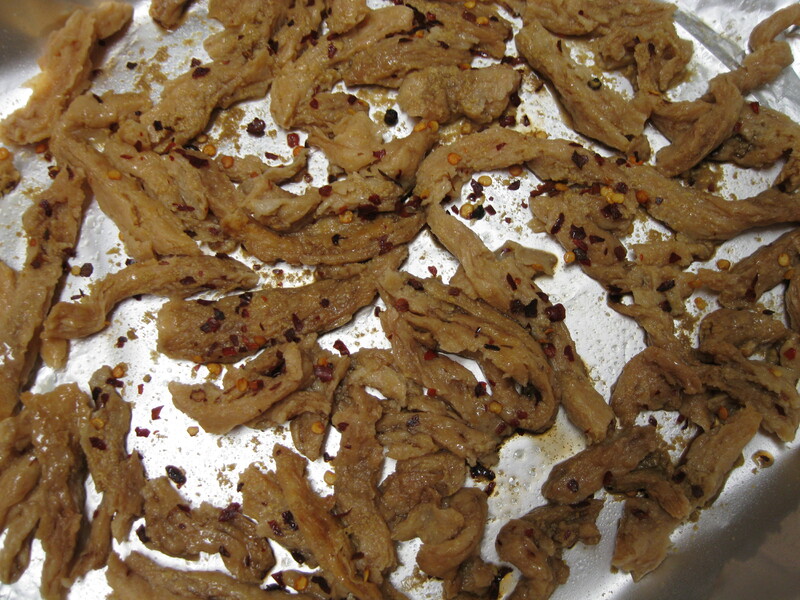 I sprinkle them with a little soy sauce, flaked red pepper, nutritional yeast (optional), and a spray of olive oil. I bake them at 300F/150C for 30 minutes or until the edges start to brown. This is what they look like before baking. Now comes is the easy part. 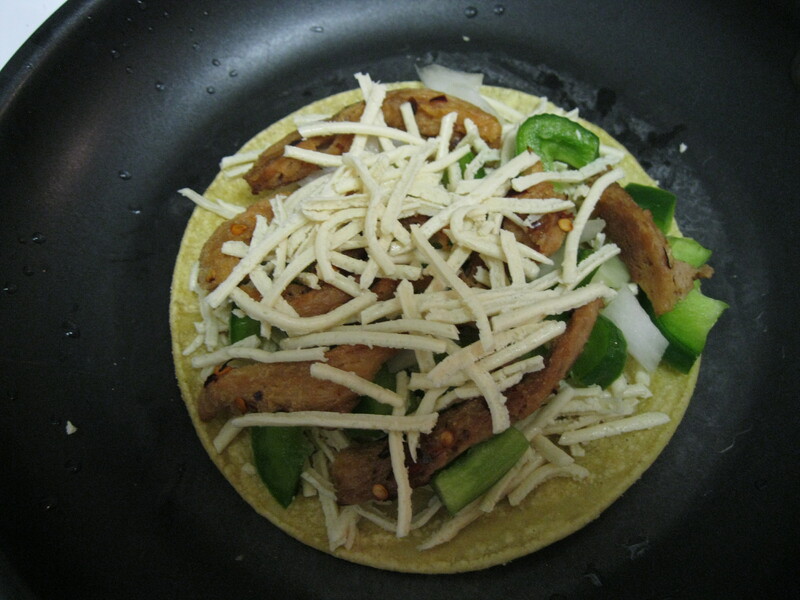 Place a tortilla in a lightly oiled nonstick pan, add some “cheese” and a light sprinkling of onion and bell pepper. I added a few strips of my soy curls and then put a little more cheese on top. You don’t need a lot of cheese: just enough to get things to stick together. Add a few drips of hot sauce as your personal taste dictates. On medium heat, wait until the cheese starts to melt (use your nose to avoid scorching), then add that second tortilla and flip. 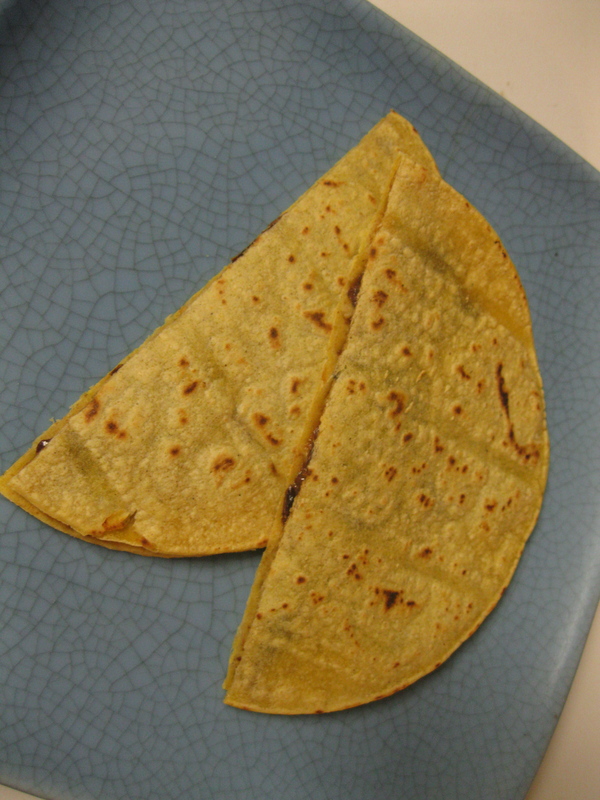 Push any fillings that fall out back into the quesadilla. The cheese will hopefully trap it as it melts. This is such an easy meal or snack. 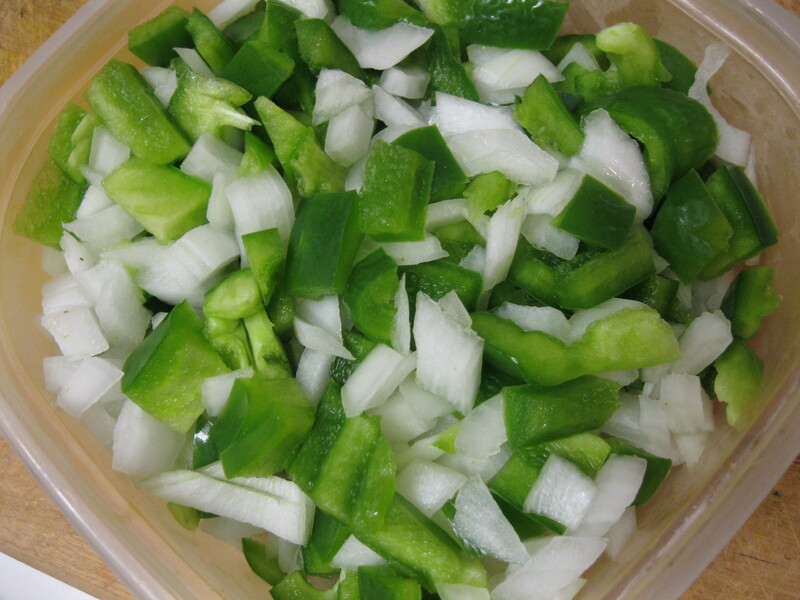 I literally keep a container of mixed bell pepper and onion in my fridge. It looks like this. I made some guacamole to go with it and sliced up some tomato and cilantro to go with my vegan quesadillas.